Before the Krewe of Hunters, there was Harrison Investigations. 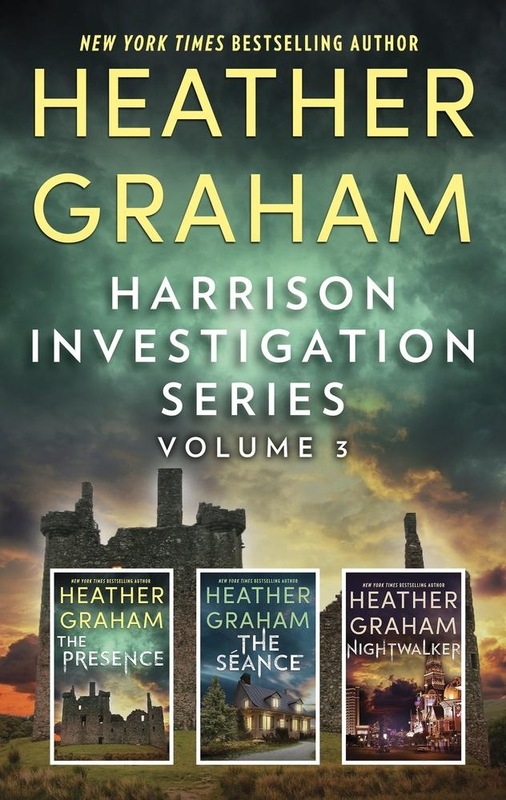 Together for the first time in one value box set, three stories of romantic suspense tinged with ghosts and mystery, only from New York Times bestselling author Heather Graham. The Presence Toni MacNally buys a run-down Scottish castle to turn it into a tourist destination, completed by inventing the perfect story about the ghost of the imaginary laird Bruce MacNiall. Then someone arrives claiming to actually be Laird MacNiall—a tall, dark, formidable Scot. Around the same time, the bodies of young women are being found in the nearby town. Toni’s sinister, lifelike dreams suggest the impostor is connected to the recent deaths. Bruce claims he wants to help catch the murderer. But even if she wants to, can Toni trust him…when her visions seem to suggest the tempting laird might be the murderer? The Séance A chill falls over Christina Hardy’s housewarming party when talk turns to a recent murder that has all the hallmarks of the so-called ÔInterstate Killer’ murders from fifteen years before. To lighten the mood, the guests drag out an old Ouija board for a little spooky fun—and that’s when things become truly terrifying. Cop-turned-writer Jed Braden is skeptical of Christina’s ghostly encounters, but his police sources confirm all the intimate details of the case—her otherworldly source is reliable, and the body count is growing. The spirits are right. The Interstate Killer is still out there, and Christina’s life is hanging in the balance between this world and the next. Nightwalker One night, desperate for money to support her grandfather, Jessy Sparhawk places the bet that will change her life forever. Just as she’s collecting her winnings, a man stumbles through the crowd, a knife protruding from his back, and crashes into her, pinning her to the table. Hired to investigate the murder, private detective Dillon Wolf finds himself fascinated by the gorgeous redhead who’d been trapped beneath the victim—and by the single word the dying man had whispered in her ear. Indigo. One murder leads to another as Dillon and Jessy realize that the nightmare is only just beginning—and that the dead still have a hand left to play. 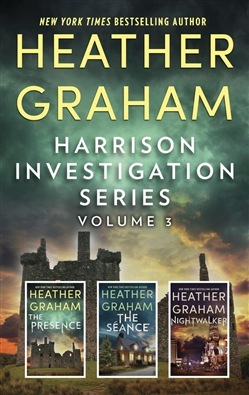 Acquista Harrison Investigation Series Volume 3 in Epub: dopo aver letto l’ebook Harrison Investigation Series Volume 3 di Heather Graham ti invitiamo a lasciarci una Recensione qui sotto: sarà utile agli utenti che non abbiano ancora letto questo libro e che vogliano avere delle opinioni altrui. L’opinione su di un libro è molto soggettiva e per questo leggere eventuali recensioni negative non ci dovrà frenare dall’acquisto, anzi dovrà spingerci ad acquistare il libro in fretta per poter dire la nostra ed eventualmente smentire quanto commentato da altri, contribuendo ad arricchire più possibile i commenti e dare sempre più spunti di confronto al pubblico online.